House price expectations in Sweden close to record level, shows SEB’s Housing Price Indicator as it edged higher in July to 67 from 66 in June. The indicator is now only one point below the all-time high from March this year. According to the survey, 75 per cent of Swedish households expect home prices to be higher in 12 months' time while only 8 per cent foresee lower prices. The Housing Price Indicator has changed very little since February this year and the average level during the last 6 months is clearly the highest for any 6-month period since the survey started in 2003. This highlights the currently very strong momentum in the Swedish housing market with home prices increasing by 15 per cent year-on-year. 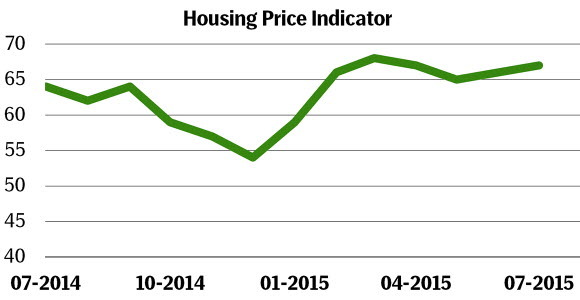 SEB's Housing Price Indicator suggests that prices could accelerate further in the second half of this year. Higher price expectations in the south west (which increased to 73 from 64) contributed most to the upturn in July, while expectations in the Stockholm area dropped to 68 (from 77). Volatility for the regional indices is high and monthly movements should be interpreted with care. Looking at the trends over the last 6-12 months it seems like the upturn for the housing price indicator is driven by regions outside Stockholm, while Stockholm is largely stable at a high level. The share of households that plan to fix rates in 3 months remained unchanged at 5 per cent in July. There are still few signs that low yields are causing households to shift towards a larger share of fixed rates which probably reflects that households do not expect the Riksbank to start hiking rates anytime soon. According to Statistics Sweden almost 80 per cent of new mortgage loans have floating rates.